If mist could be furry it would look like this dreamy vest. This scrumptious purple mist faux fur fabric has been used to create this high collar zip front vest. This dreamy purple fur allows for a lot of fun fashion options for your young diva. A glitter screen printed star inside reminds her that she is a shining star. 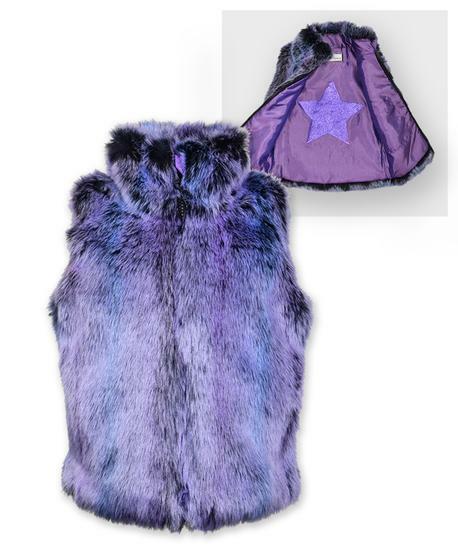 The cell phone pocket will help keep her in touch with her adoring fans.This faux fur vest features a high collar, zipper front, side seam pockets, cell phone pocket and a purple iridescent crushed taffeta lining with a purple glitter star on the back lining. This vest sports a perfect combination of style for your starlet. Sizes available are from 2-12. 87% Acrylic, 13% Polyester. Machine Washable. Imported.